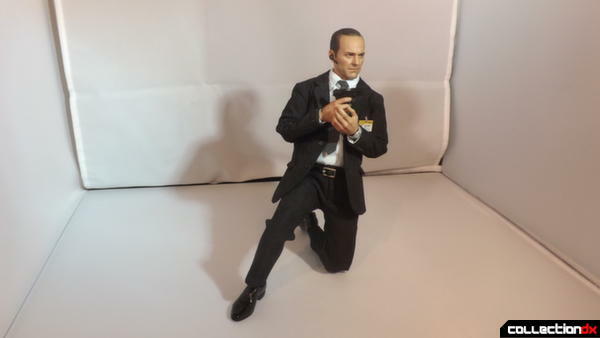 A figure that Hot Toys managed to sneak out before Hulk and Iron Man Mark VII, Agent Coulson in toy form at last! 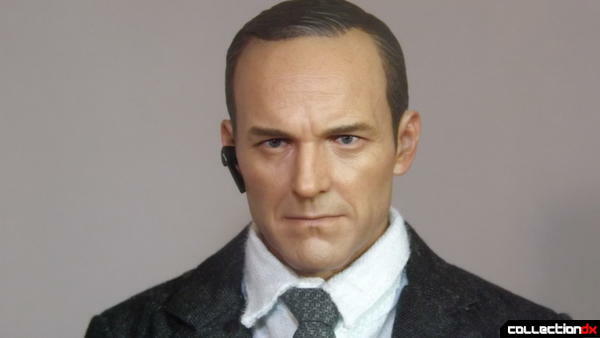 Coulson was originally supposed to die at the end of the first Iron Man film, lucky for fans and Clark Gregg, he was saved and quickly became a beloved character even making cameos in the most recent Spider-Man cartoon. 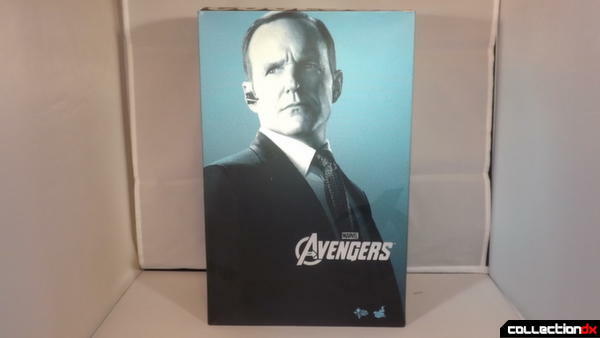 Now Coulson leads his own team in Agents of S.H.I.E.L.D. that aired in the US on Tuesday and here in the UK this Friday. 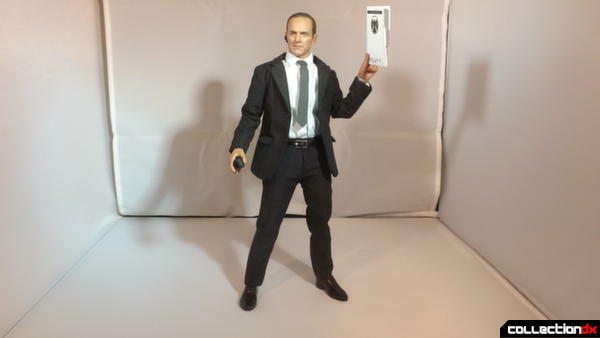 This figure is based on the Avengers appearance of Coulson and includes accessories he used in that film. 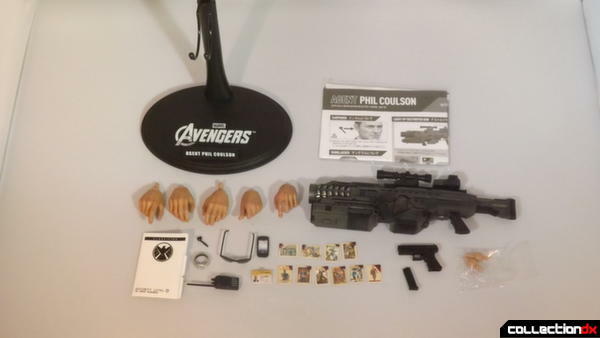 Including the usual Hot Toys black stand, instructions, 3 left hands and 2 right hands, two extra wrist pegs, the Destroyer Weapon, a hand gun with removable clip, a pair of sunglasses, S.H.I.E.L.D. 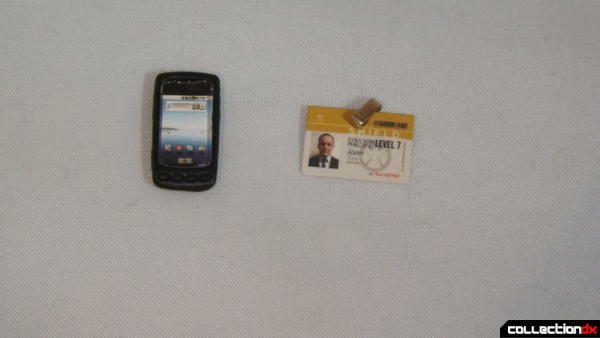 documents, ID badge, Smartphone, Walkie Talkie, Bluetooth earpiece, silver wrist watch, and a set of Classic Captain America trading cards (with blood stains). 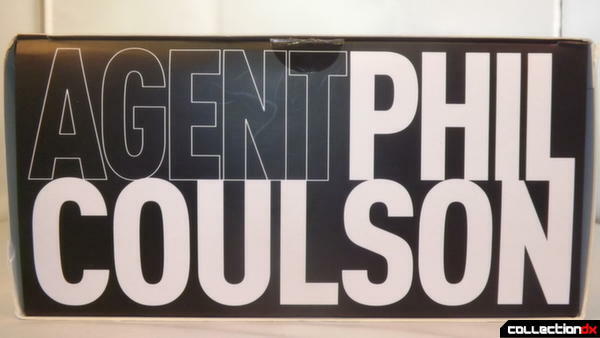 The Smartphone and ID badge are insanely detailed for such small things, you can make out the apps on the phone and the details of the ID badge, revealing Coulson`s full name as Phillip L Coulson with Level 7 clearance. 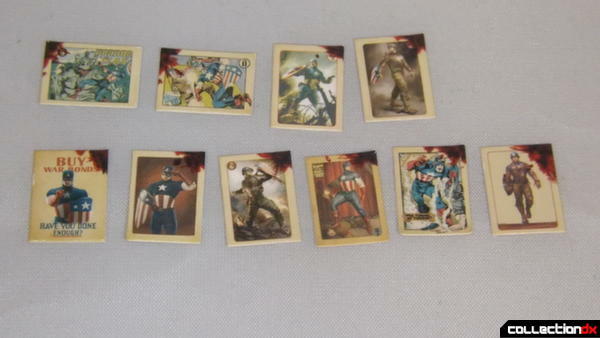 The detail carries over to the Captain America trading cards, these cards are about a centimetre long yet you can still make out the pictures, including 3 cards showing classic Cap comic book art, 5 of them are art versions of Chris Evans` Cap, the final two are tiny photo`s of Evans as Cap. 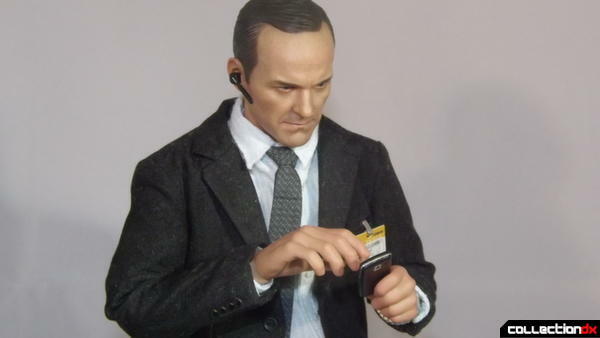 Coulson can hold all these accessories, the Bluetooth headset has a small peg that fits into his right ear, the headset is so tiny and fragile i'm scared to lose it. The glasses fit nicely over his face and ears and the ID badge clips onto his jacket pocket with a small metal clip, though this clip isn't that secure. 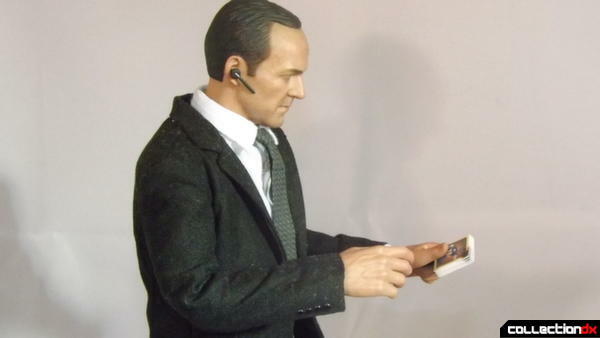 His hands are molded to hold certain items, though one left hand works best to hold the trading cards, phone and document folder due to it having a tighter grip. 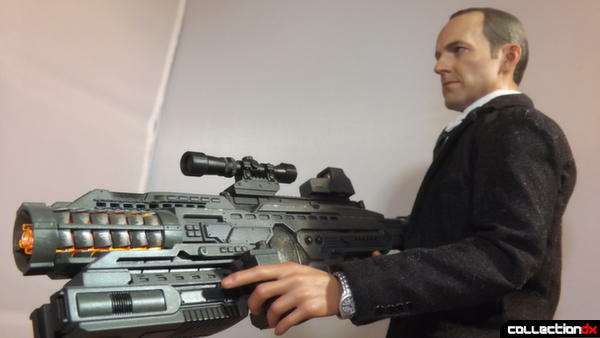 Coulson has one gun holding hand that you can have the index finger hold the trigger of his handgun and Destroyer gun, more on that later. 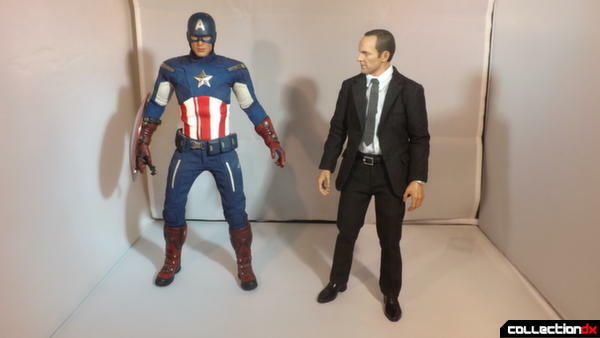 For articulation Coulson has the standard Hot Toys body but his arms and legs are hindered by the cloth suit he wears. He does have a joint in his torso that allows him to crunch forward and back. 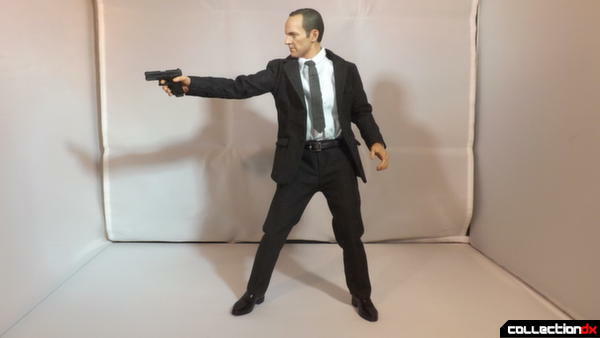 This figure is one of the few Hot Toys figures I`ve had that I can get in a decent kneeling position. Hot Toys has done an amazing job on the head sculpt, as always. 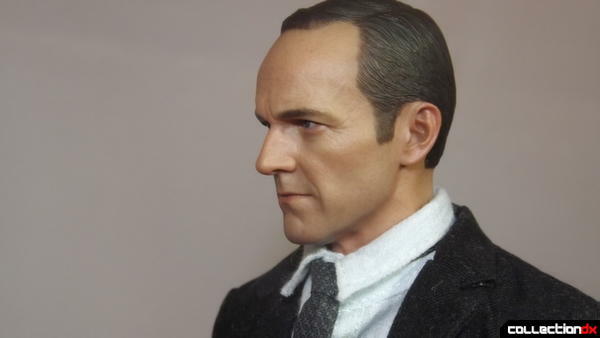 It really does look like Clark Gregg from all angles (this is the real test for Hot Toys head sculpts). 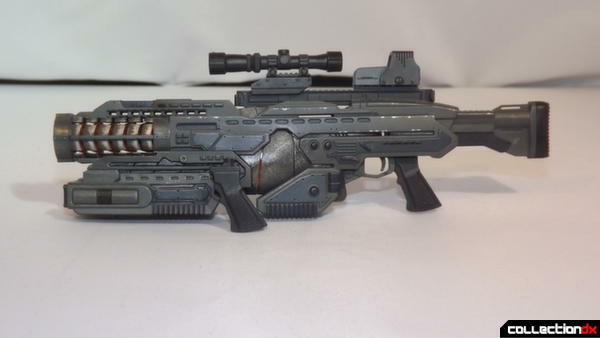 Now the Destroyer Gun, built by S.H.I.E.L.D. 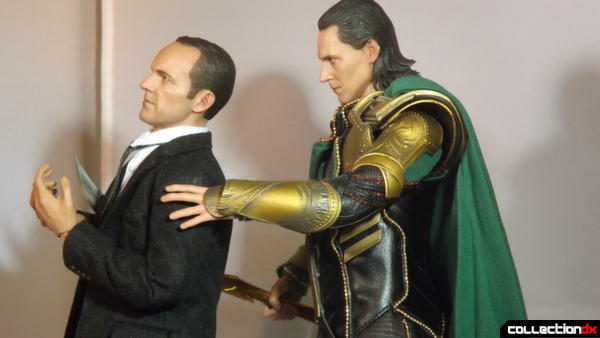 to combat Asgardians. 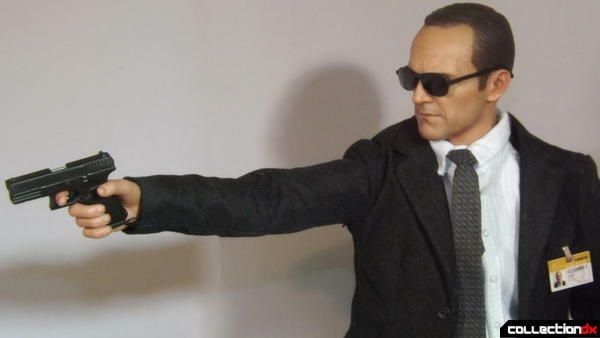 In this set the gun can be held by Coulson, his right hand holding the trigger, his left holding the handle on the barrel. 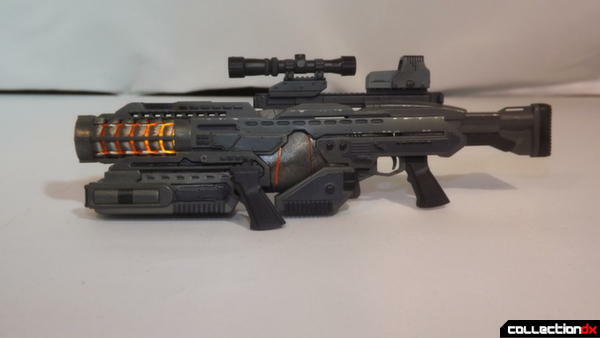 The gun has a light up feature that you activate by a small square button on the bottom of the barrel. 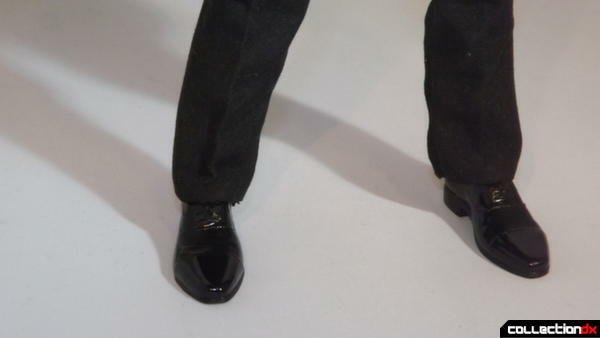 I thought i`d add a wee picture of Coulson`s shiny shoes here. My gripes with this figure are about his suit. 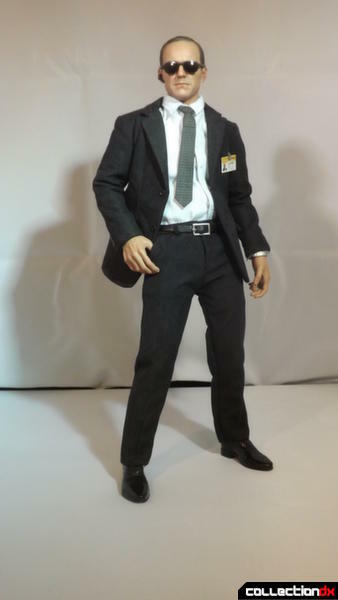 The black jacket and pants attract dust like magnet and is hard to clean off, the shirt bugs me that it hasn`t been sewn in straight into his pants and the collar isn`t straight either, up close it looks a little cheap. 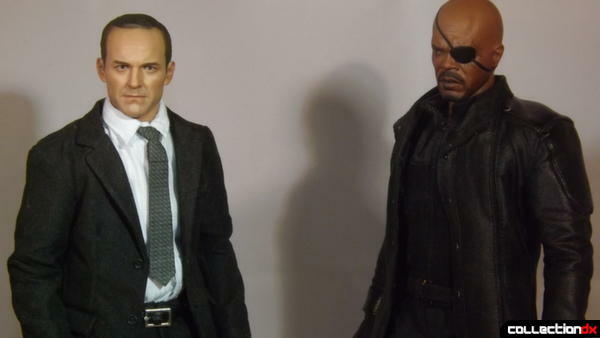 But even with these issues I still love this figure, I have a big soft spot for Coulson and seeing that Clark Gregg was so excited to have his own action figure is heartwarming. 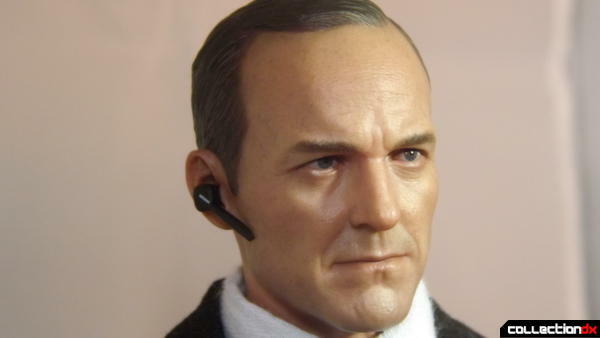 If you collect Hot Toys, Coulson is worth having in your collection. 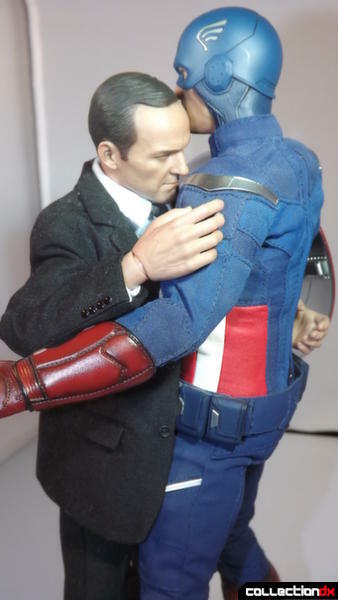 And now, Coulson being so excited he cries in Cap`s arms. 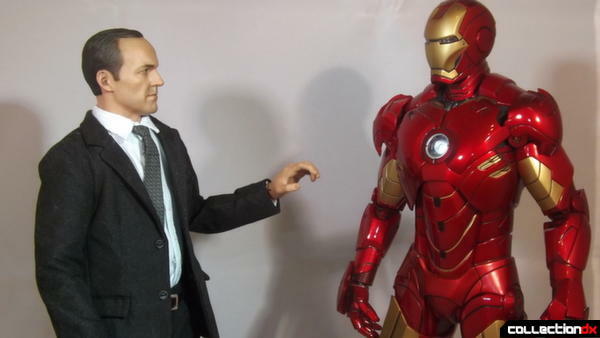 Plus some size comparisons with other Avengers and an "action pose"
you`ve beaten me to all the iron man figures i have. and then i hope i can beat you to the mark 42 next year! I've got the new Tony Stark with the Mk 42 parts here ready to review next. The Iron Man stuff is kinda my thing ;) It would be great to have someone covering the other characters, though. I never get around to picking up guys like Thor or Cap. You, sir, have made me chuckle this morning. so far ive been told to get a room with 2 other reviewers here! Looks like we'll need a few more rooms. Floor plan includes, two bedrooms, one bathroom, and a great big arena where there should be a kitchen so you two can fight it out! 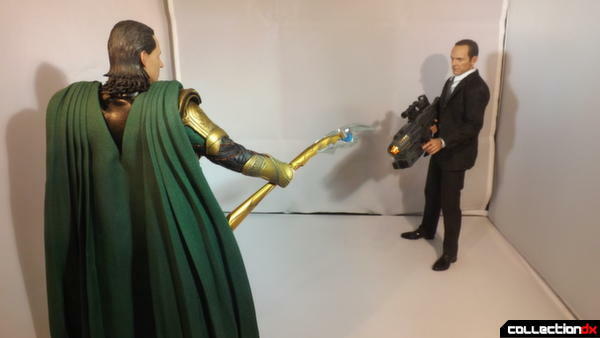 ...especially Coulson who got a fish tank for his super jet. pah, talk to me about authority!